Josh Hermsmeyer is the creator of airyards.com and Air Yards based metrics PACR, RACR and WOPR. His analysis has been published on Rotoworld, Rotoviz, Rotounderworld, and he authored the chapter on Wide Receivers in the Fantasy Football U published by Rotoworld/NBC. Josh created a class on wide receiver Air Yards at Rostercoach and has published research on Quarterback efficiency and NFL player game speed using NextGen Stats data. Follow Josh Hermsmeyer on Twitter: @friscojosh. Week 14 of the Air Yards Buy-Low Model is here. Last week the model had a 50 percent hit rate along with three good pops. For new readers, the Buy-Low Model looks at players who have received opportunity in the form of targets and air yards in the previous three weeks and offers an expected fantasy points value based on those inputs. It then highlights which players underperformed relative to that expectation. The key insight behind the model is that opportunity is sticky and production in the form of catches, touchdowns and shot plays are not. You want to buy the signal and fade the noise. The list highlights players who are strong candidates to have a performance spike in the near future. This week the model sports an out-of-sample r-squared of 0.53. The predictive power of the model continues to dip near season's end. 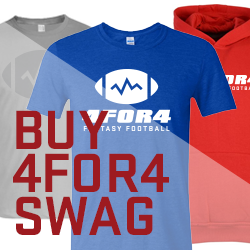 This is a free offering in our weekly content contained in the 4for4 DFS subscription. To get access to all of our weekly DFS analysis, sign up here! In GPPs you need to look beyond the median projections and identify value plays that are low-owned that can set your team apart and put up crooked numbers. Here is a list of receivers and tight ends who have underperformed their volume for the past three weeks that the model thinks could be in store for a bounce-back week in the near future. Maybe even this week. Chris Herndon ($3,000 DK/$5,500 FD) is no-name that the model likes this week. Last week both Marcell Ateman and C.J. Uzomah were hits for the model, and Uzomah makes a return appearance. Both Herndon and Uzomah are incredibly cheap and worthy of a tournament lineup or two. Over the past three weeks, Taylor Gabriel ($3,900 DK/$5,100 FD) edges out Allen Robinson for the largest weighted opportunity on the team (0.50 vs. 0.49 WOPR). Both make the list with Mitch Trubisky possibly returning to the lineup. The last time both were on the list, the Chicago offense scored five TDs. Willie Snead ($3,700 DK/$4,700 FD) makes the list for another week and some are suggesting I should simply redact his name like I did Kelvin. I feel you. But I think he's about to fall off the list due to his own shirking target share, and that will fix the glitch. Still, he's dirt cheap on FD and exactly no one will own him. Jimmy Graham ($4,400 DK/$5,600 FD) is interesting due to the upheaval in Green Bay. Perhaps his opportunity will increase with a more effective game plan. At his price, it's worth paying up to find out. Photo by Jim McIsaac/Getty Images.